Cabernet Grill bills itself as a Texas Wine Country Restaurant. Located on the outskirts of Fredericksburg, Texas in the heart of Texas Hill & Wine Country Cabernet Grill offers up an array of Hill Country Grilled Fare in a pleasant, rustic environment. I started my meal with the Hill Country Caesar Salad ($8.00). This Central Texas version of it’s namesake classic is made with fresh whole leaves of Romaine lettuce topped with a creamy garlic dressing, pecorino cheese and peppered croutons. It was good albeit a little small in size and a bit hot tasting from a little too much horseradish. Still, it made for a nice start to the meal while waiting for my entree. My entree for the evening was the Lobster Topped Chicken Fried Certified Angus Beef Ribeye ($29.00). It was good and odd at the same time. Topped with a green chile cream gravy I’d say remove the lobster and add some more fresh sliced green chile to the gravy and kick up that aspect for a spicy southwestern chicken fried steak in lieu of the lobster presentation. The richness of the lobster was just too much on top of the richness of the fried steak in addition to the rich cream gravy. Too much of a good thing. The three cheese grits were a good side. The vegetable melody was inedible due to an aroma exactly the same as TCA taint. I’d pass on this entree next time. My dining partner and myself wrapped up the evening with the Triple Chocolate Mousse Cake ($8.00). This sugar bomb was rich, heavy handed on the chocolate and sugar from the three types of chocolates laced with dense cheesecake slices. This is definitely a dessert to split between two people. It is too big for one with so much sugar. A couple of spoonfuls per person is more than enough. Service was good although at times our server seemed a bit over the top with his comments. Kitchen service was a good pace. Cabernet Grill features an all Texas wine list. We had a 2016 Lewis Cellars Rose High Plains that paired effectively with the two spicy entrees we had. Plenty of choices to match your meals and overall Texas wines are greatly improved over just a decade ago so go local and enjoy. Reservations are highly recommended. Major credit cards are accepted. Attire is Casual Friday; Jeans or Slacks plus a nice button down shirt are mandatory in my opinion. Parking is in the lot and street along the restaurant. Conclusion: Cabernet Grill is a good Fredericksburg dining option. Not necessarily a destination all on it’s own but I wouldn’t hesitate to return if I was in town. Well it is still raining cats and dogs here in Ponta Negra so we finally gave up just short of 1PM today and walked roughly 1-2 blocks from our hotel Apart Hotel Serantes to grab some lunch and watch the Chile-Greece game at Max Fast Food. We ordered two beers and two burger combinations. We thought a good old burger would be great after tons of “sun dried meat” that seems to be everywhere here in Natal. After several minutes the waiter returned to the table and explained “there is no sauce”. After quizzing him a bit I finally realized what he really meant was “there are no patties” for the hamburger. However, he could strongly recommend the sun dried meat for two that comes with beans and rice and everything else we’ve already had 3 or more times in 3-4 days here in Natal. OK, I give. Bring it. Disappointed again. Thought I was finally getting a burger. The food was fairly quick to come out but not exactly what I would call “fast”. Guess that is reserved for the non-existent hamburger. The food was OK. Not the best version of sun dried meat I’ve had so far but it was acceptable. Towards the end it just got too dried out and too tough to eat so I pretty much just gave up at the end. I would say that I wouldn’t order it again but the smell of their salmon and tilapia set me off so bad I think I’d stick with the beef and chicken dishes myself. Then again, I’d stick with the burger if they had it. 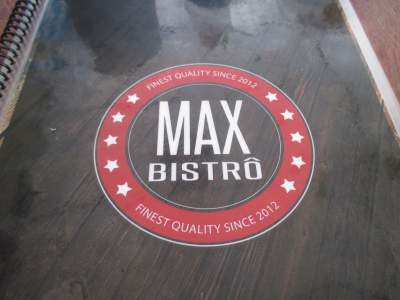 This day Max Fast Food did not accept credit or debit cards. Cash only. I’m not sure if that is temporary or permanent so be prepared to pay in cash. There just happens to be an ATM right there in the restaurant. Convenient. Conclusion: I have no desire to go back to Max Fast Food. It has some decent reviews online so you can weigh the pros and cons yourself. Growing up as a child of 60s in then what was an almost sleepy Oak Cliff, Texas I had many fond memories including at least a few that involved dining and learning about food. During the 60s most people prepared meals at home. It was rare to go out to dinner, typically saved for only special occasions. As a result there was typically one nice restaurant in each town where you could go for a special evening by 60s standards. We would dress up in our Sunday finest as one called their nice dress clothes back then and head out for a formal evening of dining at the local restaurant. One fond memory of our local restaurant was the back door. Yes, I said the back door. When you went through the front door you were greeted by the maître d’ or white coat and tie adorned waiters. When you pulled into the alley to the back door a kitchen worker would walk out through the screen door and in exchange for a pre-set sum of cash money he’d bring out to your car a complete meal for four that you could take home and save yourself the time of preparing dinner that evening. I always thought as a child this was the coolest thing. Instead of dressing up in Sunday clothes I could sit in the back seat in my play clothes carefully holding the evening’s bounty between me and brothers. 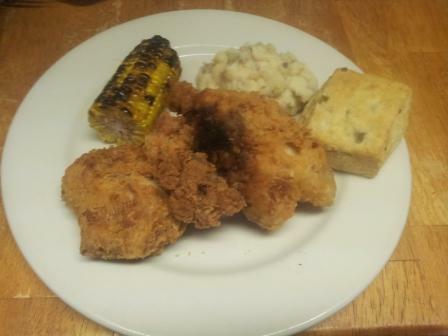 The fare was always simple, in almost every case fried chicken, mashed potatoes, green beans and biscuits. The quintessential southern supper and we called it then. Flash forward 40 years and here is where Chop House Steak & Seafood enters the picture. Apparently Chef Kenny Mills grew up in a similar era and environment and at least a few times in his life picked up his dinner from the back door in the alley. This week Chef Mills has quietly introduced his tribute to times gone by using modern day social media. I was fortunate enough to read about this via twitter from Chop House and before I was able to rush over there to give it a try I was beaten to the punch by a fellow blogger Lauren Drewes Daniels at the Dallas Observer. I’ll let you read her review of the food as I mostly concur and wish to give her due credit. You can read his review here. So for $20 dollars cold hard cash you can pull up to the back door of Chop House Steak & Seafood, ring the bell, hand your money to the staff and in a matter of minutes be on your way with a filling dinner for four of Fried Chicken, fire roasted corn, garlic mashed potatoes and Jalapeno muffins. Food this quality at this price point I can’t imagine ever having the desire to swing through the local drive thru myself. You will be well rewarded with a quality, price sensitive meal and maybe just maybe you’ll generate a few fond memories for your kids too. 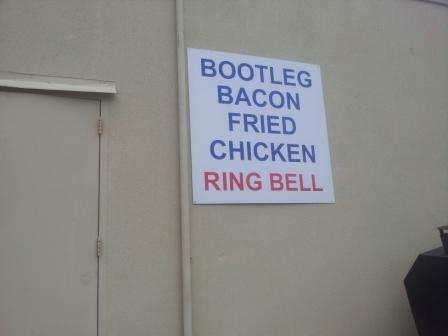 Back Door Bootleg Chicken: recommended for a trip down memory lane. Chop House Steak & Seafood is Chef Kenny Mills latest restaurant venture in the Dallas Fort Worth metroplex. Chef Mills has shifted gears slightly from his very popular, casual and inexpensive Chop House Burgers to focus on higher end steaks and seafood. Housed in the original Mimi’s location (old timer Arlington residents will remember) the Chop House offers up a nice selection of hand cut steaks with a tempting selection of appetizers to boot. We popped in on a Wednesday evening with no reservation and were quickly greeted and seated at a table for four near the front entrance. Once drinks were ordered we quickly settled on the Wednesday Special for our evening which includes one appetizer, unlimited salad bar, two filet, one side dish and one dessert for the bargain basement price of $49.00. This is definitely recommended if you’re looking to be introduced to the restaurant at a budget friendly price. We started the evening with the Crispy Calamari ($10.00) which was a good sized portion of nicely seasoned and fried calamari rings and strips unusually mixed with pepperocini and a side of chili sauce for dipping. 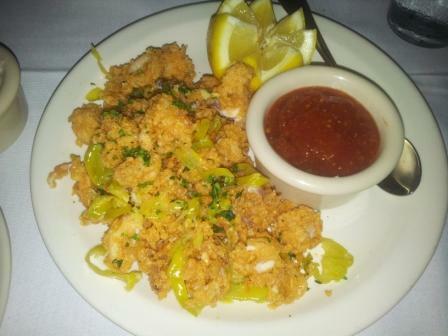 This spicy starter was a nice take on traditional fried calamari, spicy and salty without being overwhelmingly so. This appetizer is recommended. The Salad Bar (failed to note regular pricing) which is billed as a “Gourmet Salad Bar – 15 feet of seasonal mouth watering items” is a solid salad bar with some interesting offerings not typically seen on a salad bar but I did not find it to be “The evolution of the salad” as billed on the menu. It was instead a solid salad bar with enough fresh offerings to satisfy anybody desiring a salad while eating at a steak house. My entree for the evening was the Filet ($24.00 for 8oz.). The steak was cooked perfectly to medium rare as ordered with a moist, warm center. Cooked over mesquite wood and perfectly finished with a very good quality finishing salt this steak was quite flavorful and is recommended. The side of Roasted Garlic Mashed Potatoes was serviceable albeit a bit uninspiring to the palate. I wouldn’t go out of my way to order the mashed potatoes. We finished our meal with the Key Lime Pie ($6.00) which was a nice, refreshing finish to our meal. It was not a memorable dessert but then again Key Lime Pie rarely is more than a palate cleanser after a large meal. Please note that all prices listed above are the regular menu prices. Pace of service including the pace of food coming from the kitchen was good throughout the evening. The wait staff was friendly and generally around as needed during the meal without being overbearing or hovering. Chop House has a mixed beverage permit and therefore does not allow BYOB. The wine list is rudimentary at best and not recommended. Stick to cocktails and beer is the recommendation here. Chop House is open Monday through Thursday from 4:00PM until 10PM for dinner. They stay open an extra hour until 11PM on Friday and Saturday. Closed Sunday. Reservations are accepted. Happy hour is from 4PM until 7PM if you’d like to pop in for a quick drink and maybe an appetizer. Attire is casual. Try to at least put on a collared shirt to dress it up a bit. Major credit cards are accepted. Free and ample parking is available in the strip center parking lot in front of the restaurant. Chop House Steaks & Seafood: good steak and appetizer options for mid-cities diners. Rodi Bar is a neighborhood bar and restaurant located in the popular tourist area of Recoleta in Buenos Aires, Argentina. The focus here is on classic Argentinian food, heavy on grilled meats with sides of potatoes and the occasional egg tossed on top. The restaurant is popular both with tourists seeking an early and inexpensive dinner as well as locals wanting to grab a quick dinner before heading home for the evening. We popped in just before 9PM without a reservation and found a table immediately. However, this was not the case once the clock struck 9PM. Most Argentinians dine right around 9PM or later so if you’re not in the door a little ahead of that be prepared to stand in a line. There was a line pretty much during the entire time we were dining, roughly 90 minutes to two hours in length. We both ordered the Asado de Tira (Argentina Rib Steak) which is basically a cross cut bone in rib steak. We order the meat medium rare and it was presented closer to medium. We learned later that if you’re used to an American styled steak prepared truly medium rare then order your steaks in Argentina “jugoso”. The meat presented was fairly tough, full of bones including some bone chips, packed with gristle and light on flavor. All and all I’d say my first Argentinian steak was a bust. I wouldn’t recommended this myself. I’ll definitely steer clear for my next meal and try something more tried and true like the Lomo which is the Argentinian equivalent of beef tenderloin. Service was good but not great. Be prepared to chase down your waiter like in most Latin and European countries. Waiters allow you to sit undisturbed and dine at your own pace which is good except when you really want something. Then it becomes a game of catching the waiter’s eye to request something. AR $313.00 for two steaks, one frites, one bottle of wine and three bottled waters. Decent value here for the money given the rising cost of just about everything in Argentina. Rodi opens at 8PM each evening and stays open until closed. You’ll understand once you visit Buenos Aires for the first time. Reservations are accepted although it appears most people just pop in and snag an open table. Attire is fairly casual;jeans or slacks with a button down shirt seemed to be the order of the evening although I did see everything from golf shorts to business suits with ties. Major credit cards are accepted. Don’t ask about parking; I walked and wouldn’t think of driving a car around here. Dallas Chop House is a steak house that in their own words “…has been created to provide a completely new approach to steakhouse dining.” Frankly, I didn’t see it. I saw standard steakhouse fare in a standard steakhouse environment at standard (read high here) steakhouse pricing. This is not to say that Dallas Chop House doesn’t do a decent job as a higher end steakhouse in a competive steakhouse market. It just means they do nothing that make them stand out against the crowd. We arrived right on time for our 7:30PM reservation. We were quickly shown to our waiting table by the smiling, affable hostess. We were quickly greeted by our overly boisterous waiter that quickly took and filled our drink orders while we perused the menu and chatted with our dining partners for the evening. Once our last party member confirmed she wouldn’t be able to make it we informed our waiter at which point we were offered very nice rolls to nibble on while we honed in on our final dinner selections for the evening. I’m not sure why we weren’t worthy of some bread until we confirmed our final dining patron was indeed not showing but I guess that’s the policy at Dallas Chop House. I started my evening with the appetizer of Tenderloin Steak Tartare ($13.00). This absolutely huge portion of tenderloin tartare is prepared with corncichons, capers, sharp mustard, aged Parmesan and crispy lavash topped with a quail egg. I found the zesty bordering on spicy tartare moist, flavorful and very satisfying. This appetizer is recommended for lovers of tartare and can easily be shared by 3-4 people. My entree for the evening was the 18oz Ribeye ($40.00). This dry aged grass fed selection of beef was well marbled, a good quality cut and prepared perfectly to medium rare as requested. Seasoning was light yet noticeable without being overbearing. This more than satisfying portion could easily be shared if desired. This steak is recommended. Side dishes are all served ala carte. We ordered a mix to be shared by the table but I found none of them to be noteworthy myself. The three desserts we ordered to share by the table were all nice but nothing stood out among it’s peers. Service was pleasant throughout the evening from the valet to the hostess to the waiter and support staff. They were not engaging, just pleasant and seemingly available whenever needed. Dallas Chop House does not allow BYOB as they have a mixed beverage permit which precludes BYOB under state law. They have a serviceable wine and beer list with a couple of gems scattered here and there on both lists. Most wines are however three times retail, beer approaching $8-9 per serving and cocktails hitting an eye opening $14-15 per cocktail so you’ve been forewarned. Dallas Chop House is open Monday through Friday for lunch from 11AM until 3PM. They are open for dinner Monday through Thursday from 5PM until 10PM. They stay open an extra hour until 11PM on Friday and Saturday. Attire is dressy casual. Slacks and sport coat are desirable but trendy jeans and button down shirt will definitely get you in the door. Major credit cards are accepted. Parking is either self park in the Comerica Bank parking lot (fees apply) or valet for $7.00 (silly in my opinion) plus gratuity if you desire. 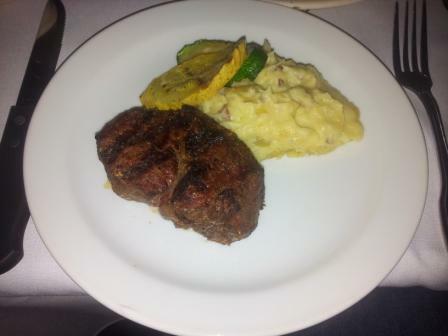 Dallas Chop House: standard steak house fare and expected prices. I would go back but won’t deliberately seek it out.